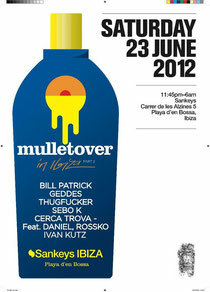 mulletover will return to Ibiza on Saturday 23rd June for Part 2 of their four-part residency at Sankeys Ibiza. Round two finds Bill Patrick, Sebo K, Thugfucker and Geddes taking care of Room 1, whilst Cerca Trova - the hosts of some of London's most clandestine events - with residents Daniel, Rossko & Ivan Kutz (Nomad), take hold of room 2. Rob Star, mulletover: "It was so good to be back on the island, every time I step off the plane it feels like I'm coming home! The party was great, the main room was busy right till the close (which inspired us to do a proper after-party for this one) with Joy Orbison and Julio Bashmore (on his Ibiza debut) absolutely smashing it! Can't wait till then next one on June 23rd." mulletover will also be hosting a secret after-party at a brand new location they've found. It's all top secret just now, so the boys insist that you need to come to Sankeys to find out where it's at!